When people think about going to Wisconsin to drink – they almost always decide to go to Milwaukee. I’ve written about Central Waters Brewing Company in Amherst, Wisconsin and today I wanted to highlight Red Eye Brewing Company in Wausau. All of this to say that Central Wisconsin is sometimes overlooked by beer drinkers from outside of the state – and there isn’t just one good spot, but there are totally enough places to take a good trip. Central Wisconsin is home to a lot of awesome local food, and tiny restaurants that are highlighted for their creativity and rotating menus. That has started seriously trickling over to the beer scene. Red Eye Brewing has a great brew pub right downtown in Wausau with a creative selection of year round and small batch beer, and a great food menu. You should absolutely take a look at their food menu before you go. Even if you’re just going to drink – I want to plug getting the Mushroom Merlot appetizer. It won’t be too filling, but will complement your time drinking beer nicely with some bread, some vegetables, and a ridiculously artful balance of wine, onion, cheese, and some sourdough bread. I had three beers when I was at Red Eye this weekend, and if you’re a fan of smokey beer, you’re in luck. I’m going to start with Firewater. Firewater is a Wild Rice Bock – and it’s so smokey that there’s a chance you’ll write it off without fully appreciating the work that went into it. For the sake of honesty – I don’t like it, but I do want to tell you why you might. First – if you like anything smokey, you’ll LOVE this. Second, the beauty of this being a bock is that it’s also coarse and a little hoppy, but you do need to let the the taste settle a second before you taste the hops. You can actually have yourself a medium weight, mildly coarse, and a hoppy smokey beer. Lots of things are happening here, and you should try it, if only for sport. The next beer I tried was a classic there: Mind’s Eye Rye. This was a great Porter and it went really well with the Mushroom Merlot I was mentioning earlier. First off, it’s smells smokey and only a little bitter. It tastes just the same, with the added value that it goes down super smoothly and there’s a tiny chocolate after taste. I’d highly recommend this one – there’s lots of a subtle flavor in a beer that is also super easy to drink. The last beer I had there, which was my favorite, is the Scarlet 7 Abbey Dubbel. This beer, as is typical for Red Eye, has a lot of flavor -but this one is particularly well balanced. The Scarlet 7 smells like dark fruit, tastes bitter at first, and leaves you with an after taste that tastes like raisins with chocolate-y notes. The Scarlet 7 is also pretty coarse, so if you like a beer you can chew on a little bit, this one is for you. 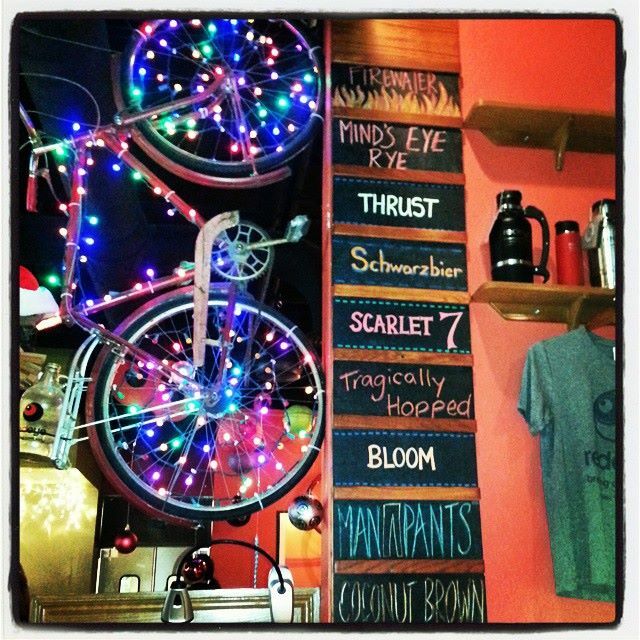 You can also occasionally find Scarlet 7 as a guest draft at O’so Brewing Company in Plover. What I was able to have this weekend really just scrapes the surface of what Red Eye has to offer. Their seasonal Rye’s are great (I had their Lemongrass Rye this summer… YUM), they are always pushing the limits of creativity with their beer, and they do the same with their food. Red Eye wins the award for being dangerously successful, and I would say the trip is totally worth it.